When I was a little girl, I loved going to the doctor because it meant free stickers. My pediatrician’s office always had stickers to give out. I once faked sick just to get a sticker. That’s when it became a problem – boy did I get in trouble when my parents found out. They would have put me into sticker rehab if they could. I haven’t been sick in a while — two years to be exact. The last time I was sick, I was studying for my final exams. It was horrible timing, as always. Last week, I came down with a cold just in time for Columbus day weekend. Who knew my nose could crank out that much mucus! I spent most of my three-day weekend in bed and on the phone with my worried mom and my worried Karl. 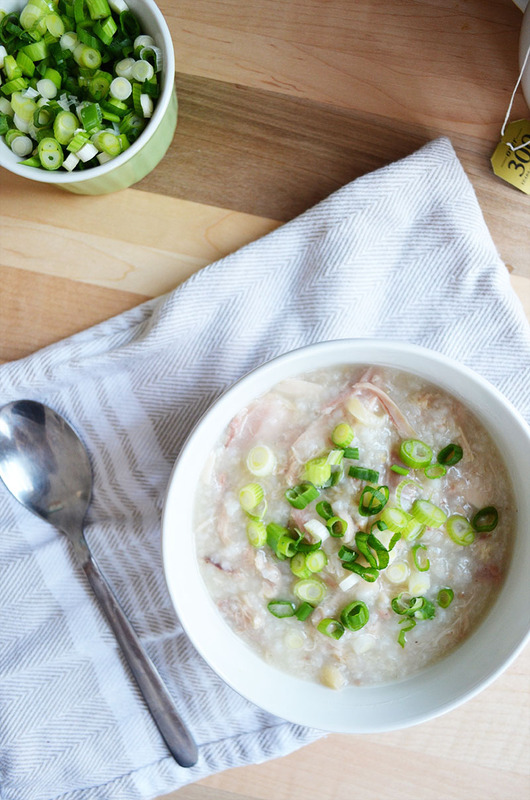 Whenever I was sick as a kid, my parents would make me jook/congee, which is a creamy rice porridge. It is very soothing. The equivalent of chicken noodle soup. It really is the perfect sick-man’s food because not only is it soothing, it is so easy to make. When I’m sick, I need something I can make semi-conscious, and this is the perfect recipe. I woke up this morning feeling a lot better, but I left work early to get more rest. On my way home, I made a stop at the grocery store to buy ingredients to make congee. I tried to walk home from the store, but I didn’t make it far. Just when I started to feel really bad, I saw a Green Cab come up the street, so I decided to flag it down. The driver was incredibly kind. He suggested I put on an old movie and take it easy the rest of the day. When we arrived in front of my apartment, he helped me out and told me that the ride was free of charge because I was sick. I had to give him a hug! Place all ingredients except the egg and green onions in a large pot or Dutch oven and bring to a boil. Ladle and discard the oil and foam on surface when it appears. Reduce the heat to medium low and simmer, stirring occasionally, until creamy, about 50-60 minutes. Remove the chicken to a plate. When it’s cool enough to handle, shred the chicken into bite-sized pieces, discarding the cartilage and bones. Add the whisked egg, then stir to combine. Return the chicken pieces to the pot, stir, then season to taste. Remove from the heat and serve with green onions on top. This entry was posted in Soups and tagged chicken, Chinese, ginger, porridge, rice. Mmm Congee! I hope you recovered well! 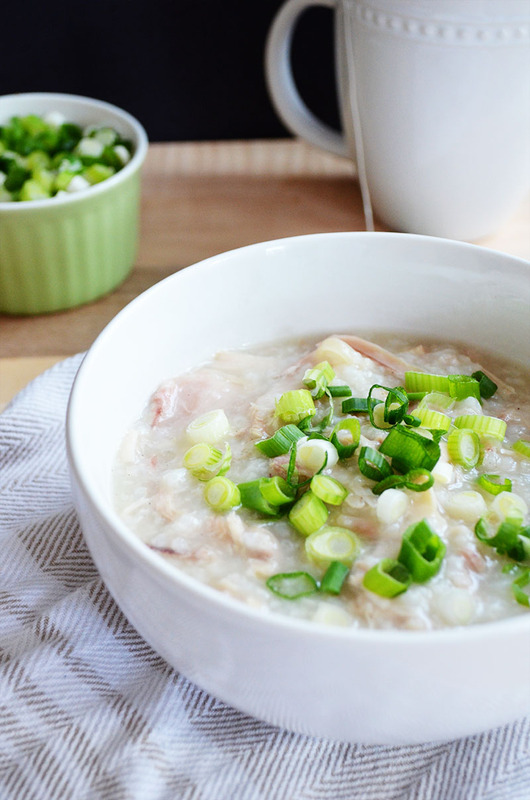 Getting sick is so bleh, thank goodness for the wonderful people in your life and also this delicious congee! You’re so sweet! Yes, thank goodness for loved ones & congee! !